I'm walking along. It's thundering. There are drips of rain. The light is bad. And I have a good idea. At a stretch, the idea might not be considered a bad one but only later did I reflect that it is not always necessary to put a good idea into practice the very moment you think of it. 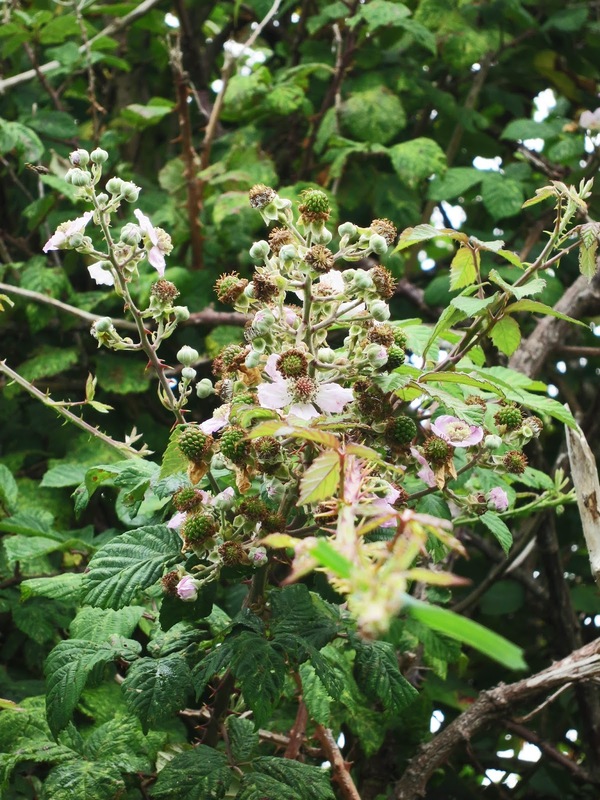 Why not follow a bramble flower from bud to blackberry? The first is that I need to be able to identify the flower - to go back to it and know which it is. The next is that it needs to be high enough that it doesn't get eaten the moment it ripens. So it has to be easily found yet not easily reached. I'm wandering along peering at the bushes. Would I remember this . . . or . . . that . . . if I returned? Then I saw a bee. 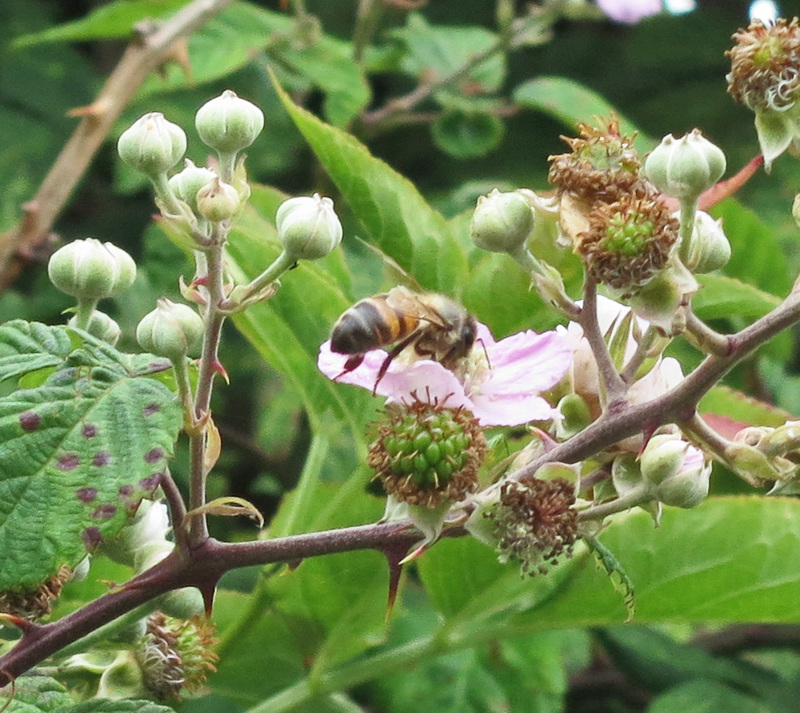 Follow the flower from pollination to fruit. How will I identify the flower? I find a branch that leads to it. How will I identify the branch? I tie a piece of grass round it. I try to re-connect the branch to the flower the bee was on. I've spent ages brightening pictures I took in the gloom and peering into them. It hasn't worked. The flower I chose is not the same as the one the bee was on. If the grass stays there I'll have roughly the right spot. See the bit of grass out of focus at the front? there's a bit of a chance I'll find the branch. The pictures will be fuzzy and lacking in the best kind of detail - I've chosen flowers my camera has to zoom to. This may be the last you even hear of the bramble. On the other hand . . . I may be asking you for recipes in the autumn. 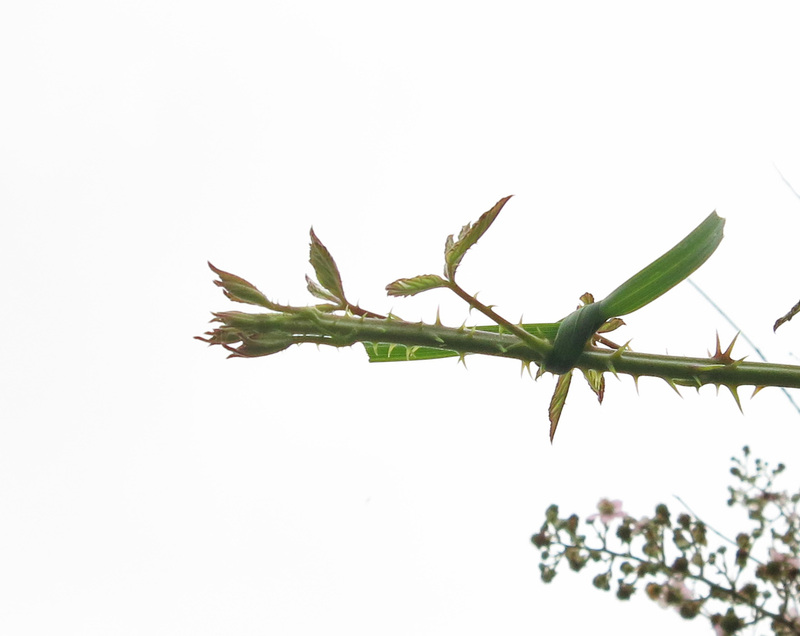 Daily photos - plants and other ordinary things. Well if you pull it of it will be a good idea, I have many of these kinda ideas ! I think that it's rather a good idea, and it's certainly one worth thinking about and trying. I shall enjoy following watching with you to see if reach fruitation! I saw my first blackberry yesterday fully ripe,is that early?